This is a perfect winter snack or side dish and it's very, very quick. I must admit that sometimes when I'm lazy (like last night) I just eat this for dinner with nothing else. It's deliciously tangy. Anna's very own recipe. Serves 2 as a side. 1. Heat olive oil in frying pan, add garlic, onion chilli and sauté until soft. 2. 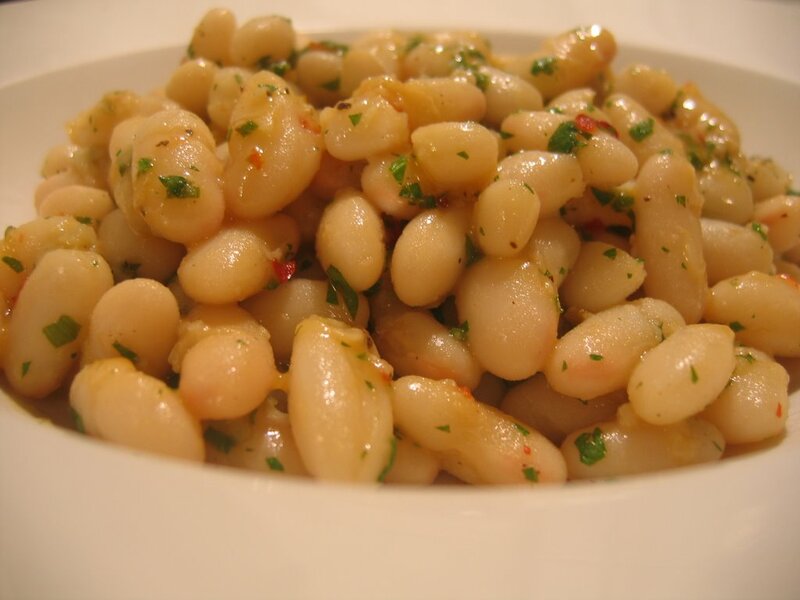 Add beans and white wine and fry until beans are warmed through. Add lemon juice and fry until the beans are moist but not wet. 3. Stir herbs through beans, remove from heat and serve. Note: You could use any kind of canned beans e.g. borlotti or butter. Yep, a very flattering photo of me, taken by Em. Well folks, this will be my last football entry since last night the Socceroos were knocked out of the FIFA World Cup by Italy. Two bad decisions from the referee put each team at a disadvantage. Early in the second half, Italian Marco Materazzi was given a red card for what looked like an innocent tumble. It was an unfair dismissal that Materazzi took with exceeding dignity. This was such a bad situation for Italy. With Italy one man down, Australia had a better chance to win and although they dominated the game with the vast majority of possession, Italy’s famous defense kept them at bay. The Aussies didn’t get many opportunities to penetrate the goal area and on the few occasions they did the world’s most expensive goalie, Buffon, was there to block them. In the final seconds of injury time Spanish referee, Luis Medina Cantalejo, made his second bad call when thought he saw Australian Lucas Neill foul Italian striker, Fabio Grosso, in the box and awarded Italy a penalty. The clock ticked over so when Francesco Totti converted the penalty the game was over and Australia was going home. It was a terrible way to end their World Cup campaign. The referee's decision is played over and over again in Australia. I almost wish the footage confirmed the ref's decision, but it clearly shows the Italian tripping over the Australian who was already on the ground. If they had lost to brilliant playing from the opposing team we could be happier, but since they lost to a bad ref call, and a dramatic dive from Grosso, it seems such a shame. As SBS reported one German fan saying "I thought they were pretty good and overpowered Italy. But I think the Italians know how to play their cards, with their theatrics, to get what they want, including penalties." But then one Australian brought us back to reality “Let's get real here and put things into perspective. 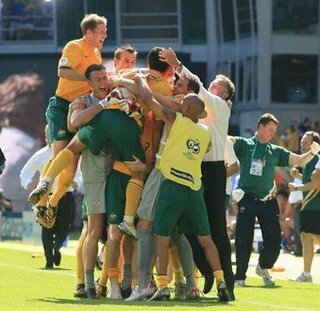 No one even expected to see the Socceroos reach this tournament let alone the second round," he said. "Now we've just seen our team dominate Italy to the point where you couldn't even tell their footballing traditions ran so much deeper than ours. All I can say to the world is: see you in South Africa in 2010." It’s frustrating that the ref made such a bad decision, but this is football. This is what happens. I just can’t believe our team accomplished so much. They should feel so proud. After the game the fans in the stadium applauded them for going further than we had ever gone before. See how emotional I am over this game. Football fever!!! On Norton Street, thousands gathered to watch the game in the freezing cold and after it was over the street was strangely quiet compared to the pre-game revelry. People were shocked. The fact that the cheering did not continue after Australia lost goes to show that most Aussies feel a close loyalty to their countries/cultures of origin but that when it comes down to it we're Australians first and foremost. With both Australia and Sweden knocked out, I'm supporting Germany, but it just won’t be the same. All quotes were taken from the SBS website. The first photo came from the SMH website. and the second from the SBS website. I have discovered a fun new blogging event called Mixology Monday and this week the recap is hosted by Jimmy’s Cocktail Hour with the theme of Apéritif. Since it’s now 6:45pm on Monday, I have to move quickly to contribute to this one, but for those who know me well, you know I have a well stocked liqueur cabinet to help me out of any drink-related pickle. My contribution to the Apéritif Mixology Monday is a simple recipe that was passed to me from my soon-to-be sister-in-law, Helena. The drink, a Fläderblom Martini (or elderflower martini), uses a flavour typical to Swedish summer and staves off Jonas’ homesickness just a bit. The flower’s flavour is light and elegant and paired with lime it makes this martini a perfect pre-dinner drink. Like James Bond, I like my martini shaken not stirred. I would usually decorate it with lime slices or thin stripes of lime zest but since I made this at such short notice I hope you can forgive the lack of decoration. 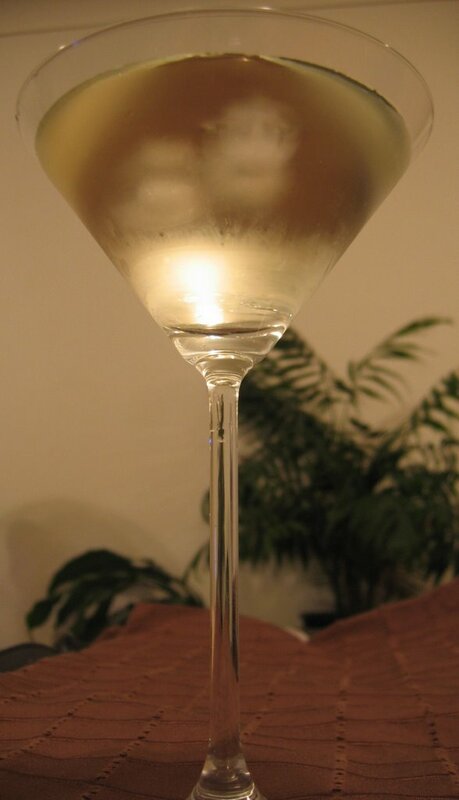 Serve in a martini glass, or even in a tumbler with shaped ice cubes. Recipe from Helena. Makes 1. Combine ingredients with ice, shake and serve. This is my second edition of Recipe Carousel where I promote seven yummy recipes featured on other blogs. The first episode can be viewed here. Tahitian Vanilla Bean Marshmallows. J from Kuidoare in Singapore made marshmallows and included several interesting recipes on how to use them. As usual the photos on this blog are wonderful. Fennel & Roast Radish Salad w Orange Thyme Vinaigrette. This one came from SurfinDaave at The Serenditipus Chef in the USA and it seems like a good crunchy, tangy salad. 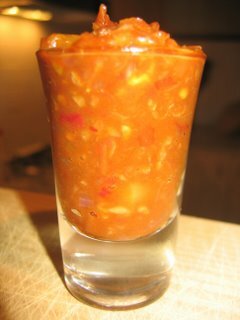 Kaeng Massaman. Austin from Real Thai in Thailand shares a wonderful recipe for this Muslim style (southern Thai) pineapple and beef curry. Green Tea Shortbreads. JulieBean from the Suburban Apron in the USA celebrated her birthday with these gorgeous cookies shaped like leaves flavoured with matcha. Rose Petal & Champagne Jelly. Ulrike in Germany from Küchenlatein (and her neighbour) grew the roses and then she turned them into an exquisite conserve. Trio of Tuna Tartare. ChubbyHubby from Singapore not only produces excellent photography of this dish but includes the recipe as well. Gourmet feasts at home indeed! According to ChubbyHubby, the best way to cook tuna is not at all. I think I can agree with that. Good tuna is best raw. Pumpkin Pots au Crème. ChefDoc of A Perfect Pear in the USA provides us with an excellent twist on the old Thanksgiving pumpkin pie with these amazing little dessert pots. Very inventive. Hola amigos! This weekend was a Mexican fiesta (partly Tex Mex) at my house. I’m not sure whether I’m stretching the Weekend Herb Blogging theme by including pulses and grains as my “herb, vegetable, flower or plant” but since I tried out some really interesting recipes this weekend I’m going to attempt to pass chick peas, kidney beans and rice off as my "greens". If no one buys that, there’s plenty of tomatoes, onions, citrus and coriander in the recipes too. This week's WHB recap is hosted by Virginie of Absolutely Green in France. My Mexican inspired feast was shared with my friend, Em, who came up to Sydney from her southern coast home. I cooked chile con carne, horchata (ground rice drink) and torta del garbanzo (chickpea cake). I have always thought of chile con carne as comfort food, even though I haven’t eaten it in some time since the “con carne” part isn’t really conducive to my vegetarian lover’s diet. I really miss chile con carne, although Jonas makes a good vegetarian version which we named chilli sin carne. Mexican Robot laughs hysterically at this and wonders what’s in it without the meat! 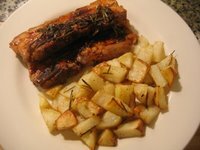 To answer that intriguing question, Jonas uses a soy sausage sliced into thin rounds – otherwise the recipe is pretty much the same as the carnivorous one. Still, nothing beats the food of your childhood. I remember Dad would make chile con carne all year round, a wonderful warm and filling meal that seemed to take forever to my young eyes. I used to watch him making it, smell the frying beef and the stewing tomatoes and grow increasingly hungry with anticipation. The time it took to simmer always seemed like hours and when making it for the very first time this weekend I was shocked at how fast it actually took. The traditional recipe probably calls for stewing beef so that the chunks will flake apart after the long simmer, but I used my father’s own mince based recipe, devised from the Tex Mex he grew up on in California (the US state not Baja). I made some slight alterations to my father’s recipe. I substituted a teaspoon of sugar for the sweet, smoky flavour of a chipotle; I added more lemon juice and a garlic clove and I garnished my food with sour cream and coriander (cilantro), which is a herb my father cannot stomach ever since, as a teen, I made him a Thai style tomato and coriander salsa that was so overloaded with coriander he swore off the stuff forever. Sorry Dad! Paul's recipe. Serves 5-6 people if served with rice. 6. Garnish with some sour cream and coriander. Serve with rice, flour tortillas or corn chips. 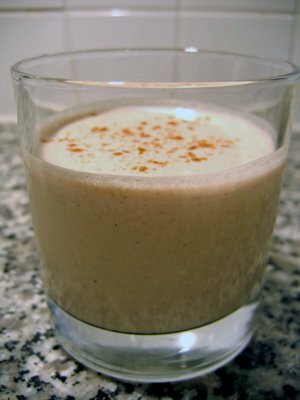 Next recipe off the rank was a tasty beverage called horchata. It’s a creamy Mexican drink flavoured with cinnamon, almond and lime and is completely dairy free. I had never made it before, and unfortunately the texture of my first attempt was not quite right. Having tried a good version at a Mexican Christmas party thrown by Bicky and Robot, I knew mine was much too gritty. 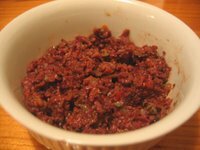 I’m not sure how to combat this either, since I used a food processor and a blender and couldn’t seem to turn the rice into a fine enough paste. Nonetheless it tasted delicious and fresh so I know I’m almost there. Em, who arrived at my home with an upset tummy, vouched for the drink’s famed ability to cure indigestion and even Jonas, who didn’t like it when he tried it at breakfast this on Sunday morning, said he could feel it doing good things for his body. This recipe came from a cookbook called 'Mexican' by Jane Milton (published by Hermes House). From Jane Milton’s ‘Mexican’. Makes approximately 1.25 litres. 1. In a sieve, rinse the rice thoroughly under cold water. Drain and place in a bowl. Top with the water, cover and leave to soak overnight. 2. Drain the rice, reserving the soaking liquid. 3. In a food processor or blender, grind the rice as finely as possible. 4. Add the almonds and as finely as possible again. 5. Add the cinnamon, lime zest and sugar. Also add 2½ cups of the reserved soaking liquid. Blend until sugar is dissolved. 6. Serve garnished with cinnamon or lime zest and some ice cubes. And finally, dinner ended with a strange and extremely easy to make dessert that happens to be gluten free. Torta del garbanzo is a very moist cake made out of chickpeas and flavoured by orange and cinnamon (although I used cinnamon’s stronger cousin cassia). I got this recipe from Jane Milton’s ‘Mexican’ book as well, although I halved the ingredients to make a smaller cake and unfortunately forgot to halve the orange juice too. 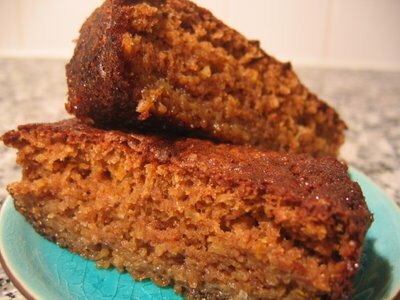 Even though the mixture was like water when I poured it into the baking tin, it still turned into an excellent cake with a crunchy top and a syrupy base flavoured with orange. I am giving you my amended version below. Based on a recipe from Jane Milton’s ‘Mexican’. Serves 6. 1. Preheat the oven to 180’C (or 350’F). Grease and line a baking loaf pan. 2. Drain the chickpeas thoroughly, and then rub them with your fingers to remove the papery skins. Puree in a food processor. 3. In a bowl, mix the chickpeas, sugar, eggs, baking powder, cinnamon, orange juice and rind. 4. Pour into baking loaf pan and bake for 1hr and 20 minutes or until a skewer inserted into the centre comes out clean. 5. Remove from oven and let stand for 10 minutes before cooling on a wire rack. Allow cake to cool completely before serving. 6. Sprinkle with cinnamon sugar and or serve in thin slices with fresh pineapple and yoghurt. Sorry, it's another World Cup moment on this food blog, but it's just so incredible: Australia is through to the knockout round and in the last 16 teams!!! 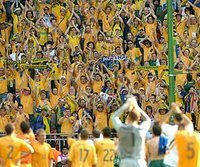 The Socceroos drew against Croatia 2-2 Thursday night in Stuttgart and for the first time in World Cup history we've made it to the second stage. Our Dutch coach¸ Guus Hiddink, who led South Korea to World Cup finals in 2002 was repeating his miracle with the Australian team. Our poor goalie, Zeljko Kalac, was almost the villain of the evening when he let an easy goal slip past him putting Croatia up 2-1. Kalac, Aussie-born but of Croatian origin, must have felt terrible at that point. But like their game with Japan, the Socceroos fought back and our international star, Harry Kewell, scored our much needed second goal in the 79th minute! 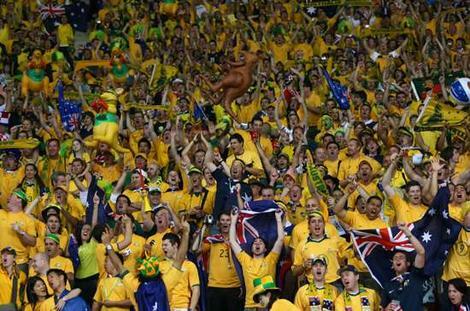 In Melbourne, some 7,000 people braved the winter weather and gathered at Federation Square at 4am to watch the game. Sydney was the same, with huge screens at Circular Quay drawing a mass crowd in the early hours of the morning. On TV we saw Aussies invading squares in Germany for all night dancing and celebrating. We made it! But Australia is not out of the woods yet. Next Monday evening in Kaiserslautern, Australia will go up against Italy. Not only are they are strong team but this will cause a lot of friction in Australia since most of the people who brought soccer to our country came from Italy. It’s true. 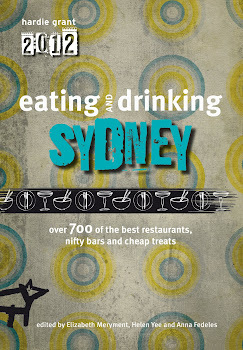 Leichhardt (Sydney’s Little Italy) will be in turmoil and loyalties will be blurred. Norton Street, the main road and my own street, has been closed every night when either Australia or Italy plays. What will it be like when they play each other??? I'm not a football expert, and I only really pay attention when it's World Cup season, but I have football fever and I have it bad. I wanted to get up this morning to watch the game but I am quite sick (AGAIN) and even sitting in front of this screen to type this entry is taxing. Whinge, whinge, whinge. Anyway, at 7am I was woken to screaming and cheering and car horns along Norton Street and I knew something momentous had happened. Suddenly my mobile phone was seismically reacting on my bedside table with messages of elation from friends all over the world. I rolled over in bed and, in between sickly coughing fits, I smiled the smile of victory. Aussie, Aussie, Aussie: Oi, Oi, Oi!!! The photos in this post came from the SMH website. I think I’ve discovered why Aztecs were such a blood thirsty lot. I recently read somewhere that they thought chocolate was an aphrodisiac so they wouldn’t let women eat it. Imagine an entire civilisation of premenstrual women without chocolate! Chocolate is pretty important to a lot of people. Admittedly women seem to be more partial than men, but I know a guy who would quite happily munch on chocolate bar while throwing back a cold beer (yes, Christian, I am referring to you). My relationship with chocolate is very cyclical. I used to want it pretty much all the time, but these days I go through fits and bursts. Now I want it in the form of desserts, rather than on it’s own. 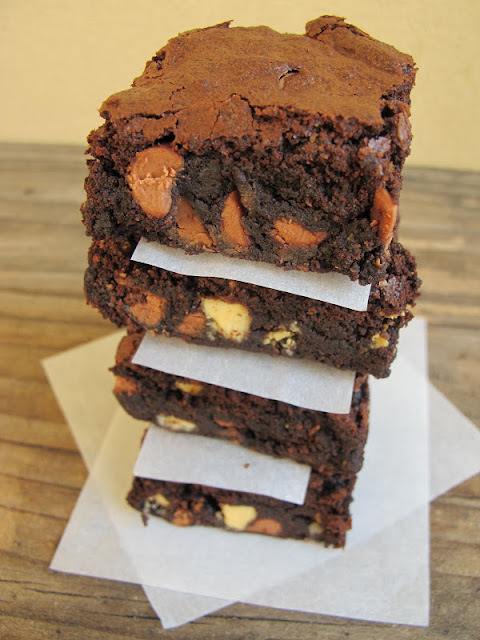 Donna Hay’s Triple-Choc Brownie recipe is pure heaven. It produces the best brownies I’ve ever tasted: so rich and so chocolaty. For this recipe I used Lindt 70% Cocoa and I served it with a shot of ice-cold Frangelico liqueur and cookies & cream ice cream. Marie Claire ‘Flavours’ cookbook by Donna Hay. Makes 20 pieces. 1. Preheat oven to 180’C (350’F). Grease a 23cm (9 inch) square cake tin and line base with baking paper. 2. Place the butter and dark chocolate in a saucepan over a low heat and stir until just smooth. Allow to cool. 3. Place eggs and sugar into a bowl and beat with electric mixer until light and creamy. 4. Fold chocolate mixer into egg mixture. 5. Sift in the flour, cocoa and mix to combine. 6. Add the milk and white chocolate then pour into cake tin. 7. Bake for 35 – 40 minutes or until set. From the canapé at Bécasse, I got the idea of how to use the Woodside goats curd I had in my fridge. 1. Cut pastry with a circular cookie cutter to make 16 circles. Place in a greased muffin tin and bake blind as per the packet instructions. Remove from oven and cool completely. 2. 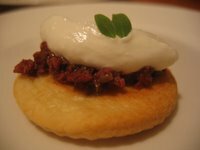 Top each pastry circle with tapenade and then goats curd. Decorate with marjoram leaves. My colleague, Jean-Baptiste (a man who I consider an authority on food and wine), once told me that dining alone takes special kind of mentality. To have the confidence to sit through a meal without company took a special skill, a certain kind of person. He explained that people who take a book are only halfway there, because they cannot entertain themselves and fall back on the book like a prop. No, only a select few can sit alone through a meal and enjoy themselves. I had always been at the book stage. I could enter a restaurant alone and order, but I needed the book as a comforter. Until tonight. It was 7:30pm and I was still in the office. Jonas was at work and wouldn’t be home until midnight and I just couldn’t be bothered cooking. And so, as I walked to the bus stop, I toyed with the idea of going to a restaurant and meeting Jean-Baptiste’s challenge. Then I recalled that a highly acclaimed restaurant which I had always wanted to try was only a block or so away. After quickly checking with Fabio and Nicki that I wasn’t being a complete fool, I marched straight for Bécasse. As previously mentioned, I have wanted to try this restaurant for quite some time but have never managed to make it for whatever reason. I was always attracted to the menus of chef Justin North, a Kiwi who worked in some of Europe’s finest kitchens (Le Manoir aux Quat’ Saisons, Pierre Gagnaire and Guy Savoy) before returning to Australia as Sous Chef at Liam Tomlin’s Banc Restaurant. Justin’s wife, Georgia North, heads the floor having honed her skills at Wine Banc, Restaurant CBD and Est. before she teamed up with her husband to open Bécasse in 2001. 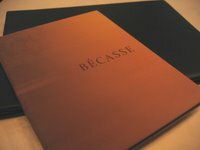 Although many restaurants talk about quality produce, boutique suppliers and responding to the seasons, Bécasse truly has this as the core focus of the kitchen. This is obvious from the who’s who of suppliers listed on the Bécasse website. 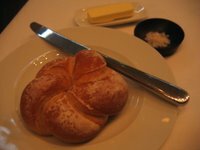 They aim for their cuisine to be “based on French tradition and a depth of classic technique with a modern innovative European feel”. When Bécasse was located at Surry Hills I’d regularly view the website (always loved that pig head photo) and try to conjure up an excuse to visit. Then suddenly they moved to the Clarence Street venue, literally underneath my office at the time. Even then I didn’t visit, but stared forlornly through the window at the lucky buggers inside. When I entered I shyly asked to see a menu, which the waitress gave me with a smile. I had a glance over it and decided to proceed with my little experiment. I waited and waited and waited to be seated. After a minute or so I started to feel a little uncomfortable as the other diners stared at this lone woman hovering around the entrance. Eventually the waitress returned and from this point forward the service was magnificent. They quickly made me feel at home with a bottle of sparkling mineral water ($5) and a nice corner table where I could view the entire dining room, both upstairs and the main floor, although not the downstairs area with the view into the bustling kitchen. While deciding on what to eat, a small canapé arrived at my table. Before I even thought to take a photo this delectable morsel was in my mouth! It was a tiny round of puff pastry, topped with a roasted cherry tomato, olive and a tiny quenelle of Woodside goats’ curd. Great, now I know what to do with the Woodside goats’ curd in my fridge! See here. Next was an amuse bouche of potato soup. It came in a tiny coffee cup and was decorated with foamy thyme chantilly and thyme leaves. 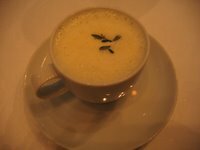 The potato had been cooked in milk and butter and the soup had absorbed the flavour of butter and thyme perfectly. Yum. I hadn’t even ordered and I was almost full on the freebies! My waitress knew her menu and could answer every question I asked. Her responses were extremely informative and yet not at all condescending. Perfect marks. After much discussion I selected the beef brisket ($42), which is the cut of meat between the fore shank and the plate, or below the first five to eight ribs. This daube (slow braise) of 100% Blackmore wagyu came topped with roasted parsnips, crispy and chewy on the outside and soft and crumbly on the inside. The beef was so tender it flaked away on my fork, full of flavour from the wonderful marbling. The brisket lay on fat raviolo which had an almost Asian influence, stuffed with meaty, earthy Swiss mushrooms and chestnuts cooked until soft. 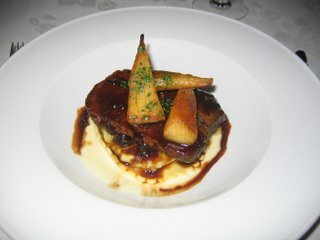 Around the plate was a delicious Bercy sauce, a reduction of red wine, shallots, port and jus. It had a strong, fragrant flavour that contrasted well with the rich brisket. 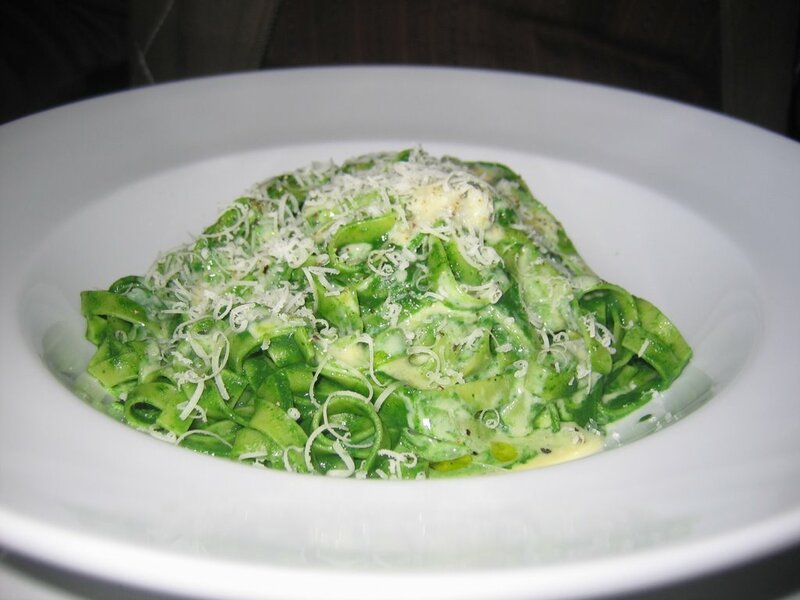 The dish was hearty, winter fare: upmarket yet homely comfort food. My bread was also very delicious. It seemed to be a sourdough, chewy on the outside and warm and soft inside. The floral shape it was baked in was a nice touch. My waitress’ wine knowledge was also excellent and she described each relevant wine’s characteristics until we found one suitable for both the brisket and my palate. Her recommendation was the Australian 2002 Austin’s Barrabool Shiraz from Geelong, Victoria ($13). Until tonight I had never considered myself a shiraz fan, but this deep, bold wine was big on flavour and not so heavy on tannins. With a bouquet of red berries and only a touch of dustiness at the finish of the palate, I was very, very pleased with this choice. In between dinner and dessert I received a palate cleanser of tropical fruit salad, topped with a tiny scoop of feijoa sorbet and decorated with a coriander leaf. The salad tasted wonderful and echoed summer flavours even on this cold winter night, although I must say the feijoa did not taste like much at all, not even guava as it is famed to. For dessert there were a few options that caught my eye: quince feuillette, Valrhona and Armagnac trifle, warm rum baba, passionfruit sable or the chestnut soufflé not on the menu but presented on special order to the table of regulars next to me (when I asked about it Georgia North was happy to oblige). 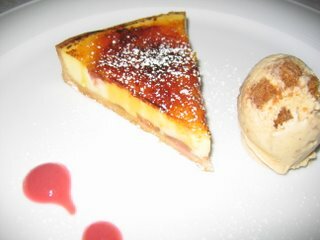 In the end I chose a rhubarb and sherry tart ($19). When the tart arrived I was a little disappointed. No where had the menu mentioned custard and this tart was very much a flat version of a crème brûlée – thin pastry topped with a warm sherry fino infused custard and a burnt toffee surface. Wafer thin pieces of rhubarb went undetected in the custard and were almost an after thought. It was good, it just wasn’t want I had expected or wanted. The accompanying ice cream was interesting however. Called pain d’epice, it consisted of a cookies and cream style ice cream of crème anglaise and spicy ginger bread. Very good. 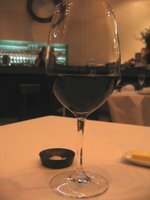 Throughout the meal I drank in my surrounds (and my shiraz) and enjoyed the relaxed Tuesday night atmosphere. The dining room is quite elegant, with huge circular wooden design features attached to the walls and strange crystal chandeliers that hover over the room like elegant Swarovski halos. I never really notice linen or cutlery when I dine out, but I did notice they have the same elegant champagne flutes that La Sala uses too. 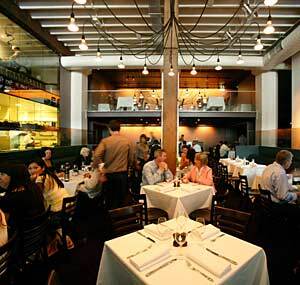 Being alone I noticed much more of the restaurants motions and became keenly aware of how good my waitress really was. I saw her serving other tables with her faultless food and wine advice and her polite and unobtrusive conversation. I also watched the restaurant owner, Georgia North, in the late stages of her first pregnancy, kindly yet persuasively turn down a very persistent passer-by who wanted to traipse through the restaurant to use the bathroom. I heard the couple next to me apologise for snapping at each other after their long day at work and listened to an English couple, on holidays in Australia, tell their friends the trials and tribulations of building their new home in the English countryside. Yes, I was the world’s biggest sticky beak! Dining on your own has some benefits. Restaurant staff seem to be much more attentive and kindly towards you. Perhaps they are concerned you’re lonely or maybe they know you’re watching a lot more. I felt relaxed and euphoric after this meal and even though I had my book in my bag the whole time, I didn’t consider picking it up even once. I have to say the total bill was a little on the expensive side since I hadn’t had an entrée and drank only one glass of wine. It came to $90 (which included a 15% tip), but oh well. Wonderful meal, wonderful service. Wonderful experience for my first time dining alone. As I walked to the bus stop, belly busting and a goofy smile planted across my face like the cat who got the cream, I considered concealing this extravagance from poor Jonas who was working hard at that very moment. But then I realised there’s no point because he’ll just read about it on the blog! Last night Jonas decided to cook. He roasted waxy kipfler potatoes with garlic, olive oil and rosemary, fried mushrooms with lemon zest and white wine and even cooked me a steak. Twas great. But the crowning glory of his meal was the wonderful and impromptu tomato chilli jam. Jonas is the condiment king. There isn't one sauce, seasoning or relish in our home that wasn't a direct result of his condiment purchasing zeal. He simply adores sauce. He once told me he loved yum cha and when I asked what he loved about it he admitted it was the chilli sauce. He told me that in his opinion the dim sum were simply conduits for him to ingest as much chilli sauce as possible. Hmm. 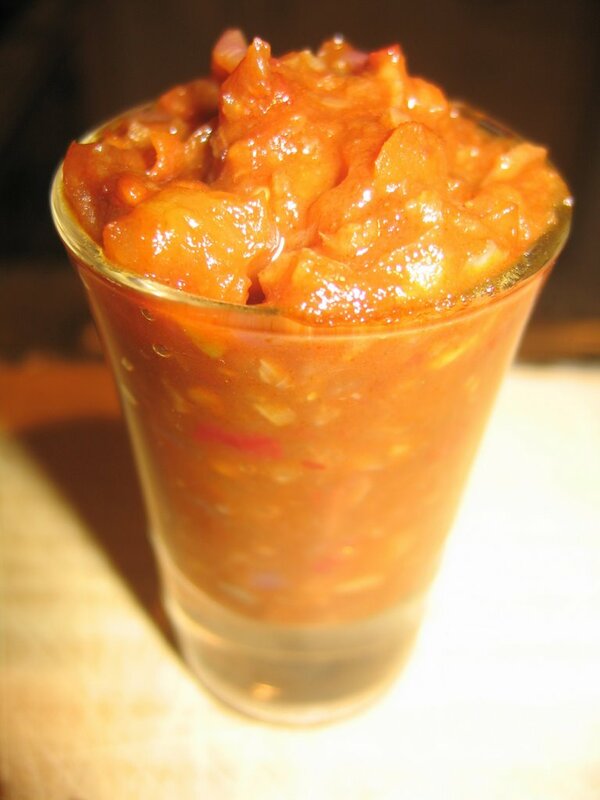 With a passionate desire for a new sauce, he created an excellent tomato chilli jam. 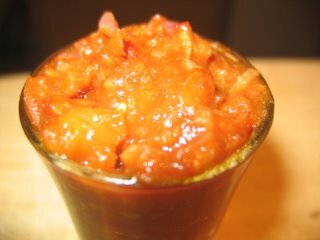 It was sweet, yet tangy, and certainly spicy. I thought it would pair excellently with hand cut potato wedges and sour cream. 1. Heat a little olive oil in a pan. Add onions and sauté until softened. 2. Add garlic, ginger, chilli and tomatoes. Soften further. 3. Add brown sugar and balsamic vinegar and turn down heat. 4. Simmer until vegetables disintegrate and break down into pulp. Mixture may dry out so, if necessary, stir through small amounts of water. 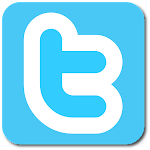 Today I want to promote some of the wonderful and innovative recipes I have discovered out there in the big, wide blogging world. In my cyber meanderings I often come across recipes that intrigue me or have me smacking my head wondering why I never thought of that myself. Sometimes it's the photos that reel me in – some of these bloggers are very, very artistic. Here are seven of my latest finds for the next seven days of the week. They are in no particular order. I'd be interested to know what other people think of these recipes and whether they'd cook them at home. 1) Aubergine Rolls Stevi in Greece (Bread and Butter) bakes eggplant slices around herbs, cheese and pine nuts. 2) Cold Potato Soup w Parsley & Capers Ilva in Italy (Lucullian Delights) makes an excellent, herby summer soup. 3) Dill Bread Christa in the USA (Calendula & Concrete) flavours homemade bread with dill, cream cheese and onion. 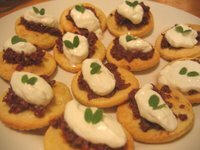 4) Apple & Red Onion Tzatziki Anne in Sweden (Anne's Food) makes an inventive twist to the classical Greek dip. 5) Sticky Toffee Coconut Cakes w Coco Jam Filling Santos in Guam (The Scent of Green Bananas) uses dulce de leche made from coconut milk to turn some wonderful little cakes into pure delights! 6) Chocolate Pecan Spread Ivonne in Canada (Cream Puffs in Venice) flips nutella on its head with a pecan substitution. 7) Bruschetta Dolce Haalo in Australia (Cook (almost) Anything At Least Once) takes this Italian appetiser concept and turns it into a breakfast treat of strawberries, hazelnuts and ricotta. It’s Weekend Herb Blogging. This week’s recap is hosted at its original home: Kalyn’s Kitchen. Catch Kalyn’s recap by clicking here. 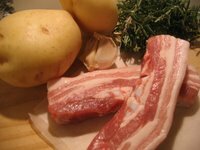 My herb moment this week came on a "meat night", meaning Jonas was working (again!) so I was cooking for one. There’s a certain freedom in being able to cook whatever I want. After years of always eating together, suddenly he’s working a lot of nights and so I’m free to experiments with ingredients he doesn’t like (e.g. eggplant) or things he doesn’t eat (i.e. meat or fish). The freedom is overwhelming. For so long I’ve scouted through new cookbooks and salivated over dishes that I had to write off because they contained meat/fish. I had craved them and sometimes even moaned about them, but then I forgot about them. If I could never have them it was best to put them safely out of my mind. But now I am free to make them, free to try whatever I want. I’m like a kid in a candy store and I don’t know what to devour first. My only problem now is trying to find all those forgotten meaty recipes again! So, with this in mind I trundled off to the local butcher and gazed unconfidently at the various cuts of meat on display. Some quails caught my eye, then the more substantial spatchcocks, but I settled on organic pork belly. I got home and sat staring at it, the pink flesh set in layers of white fat. What to do? I went outside to the herb garden (if I can call it that) and perused the selection. Mint was not to be, the oregano was close to dead and I didn’t feel like pruning the lemongrass to get the goods. Rosemary caught my eye so I snipped off some stems then rifled through the kitchen cupboards to find some flavours to match. In the end I settled on a rosemary, garlic and honey marinade. 2. Mix olive oil, honey, lemon juice, rosemary and garlic in a bowl. Add salt and pepper to taste. Add pork and coat well. Leave to marinate. 3. Heat a baking tin over the stove top. When very hot, sear pork on all sides. Remove from heat. 4. Put pork on the baking tin with skin side facing up. Pour marinade over the top. Bake for 10 minutes or until cooked but not tough (meat should be a little pink). Remove pork and allow it to sit. 5. Put baking tin on stove top over a low heat. 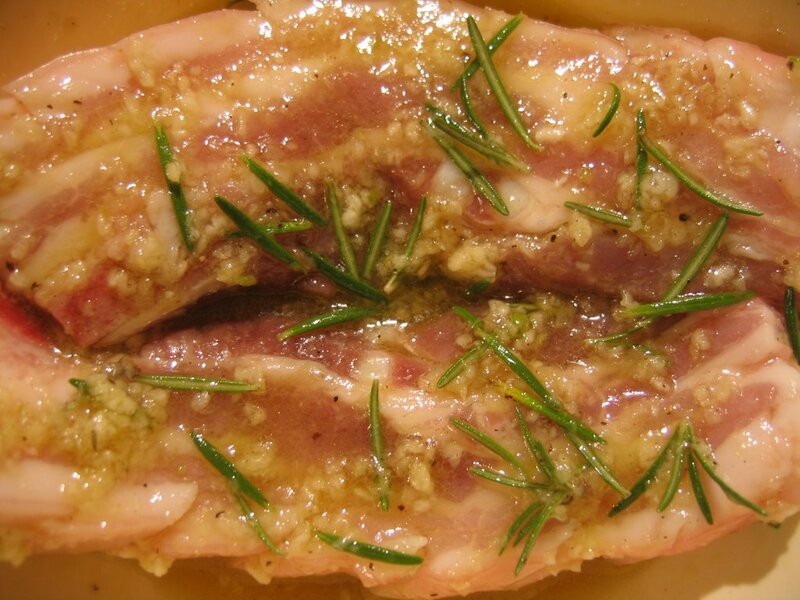 Add wine and scrape marinade pieces from tin to form a sauce. Reduce until it becomes a glaze and the alcohol has evaporated. 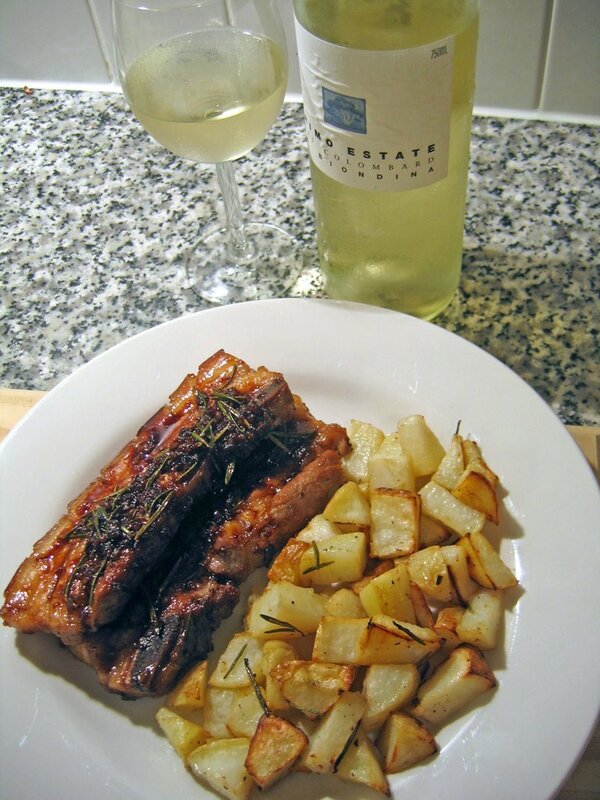 Serve pork with baked potatoes, a fresh white wine and a salad . . . . or skip the salad if it’s your meat night! La Sala is a collaboration between Restaurant Manager Andrea Mellas (Otto Ristorante, Icebergs Dining Room & Bar) and TV fame chef Darren Simpson (Le Gavroche, River Café, Aqua Luna). 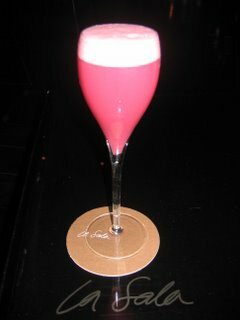 I started my birthday dinner off in La Sala's swanky bar area with a blood peach bellini ($14), the traditional nectar and prosecco aperitif. The peaches were a little unripe but the bar had done an excellent job of sweetening them subtly so it was almost undetectable. 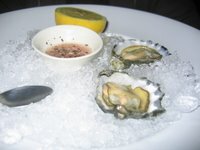 When we descended downstairs to our table, I ordered two Port Stephen rock oysters ($3.50 each), which came with shallot vinegar. The oysters were simply divine – creamy, a light taste of the sea. We also snacked on a bowl of rosemary and garlic marinated olives ($7). When it came to ordering Jonas was happy to see that vegetarians have their very own menu with imaginative options. 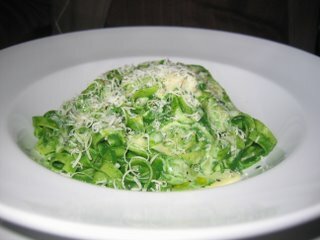 He chose the vedure mista ($16) and received a variety of vegetables, each cooked a different way. Green beans, tossed in olive oil, were topped with a salsa of kalamata olives and pine nuts; long, thin slices of zucchini and eggplant were gently chargrilled; white beans were stewed with tomatoes and topped with fresh oregano; mushrooms had been fried deliciously. What Jonas appreciated most was that every vegetable was enhanced differently and yet the natural flavour of each vegetable was present. 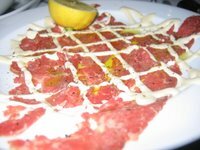 I opted for the carpaccio cipriani ($18) and it was the best I have ever eaten in Australia, or even Italy. 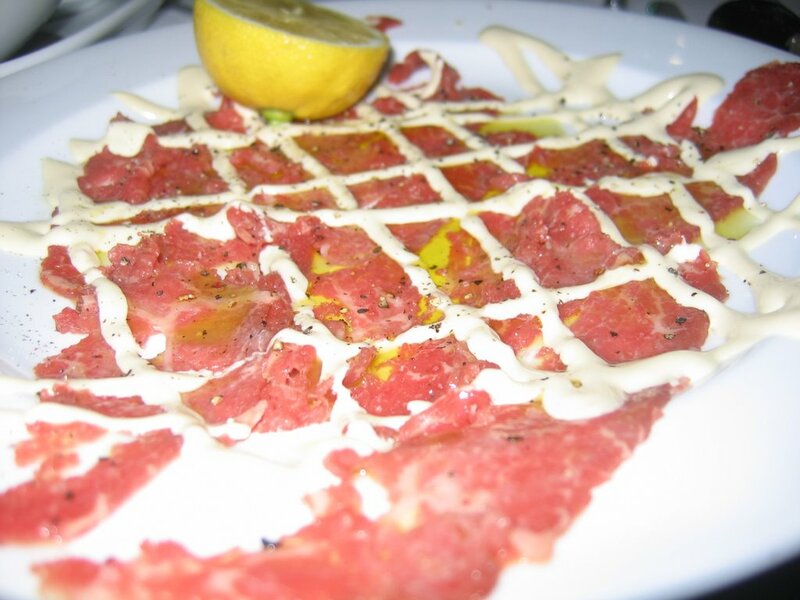 This was truly a salute to the original carpaccio from Harry’s Bar (owned by Giuseppe Cipriani): the thinnest slices of raw beef cross-hatched with a classic carpaccio sauce of mayonnaise, flavoured with lemon juice and worchestershire sauce. It was then topped with olive oil and freshly milled black pepper, and served with a wedge of lemon. The beef had a delicious subtle flavour and the mayonnaise seemed to have been made with olive oil because it exuded a wonderful fragrance. I was in absolute heaven. I then ordered two entrées instead of a main and both were very good. 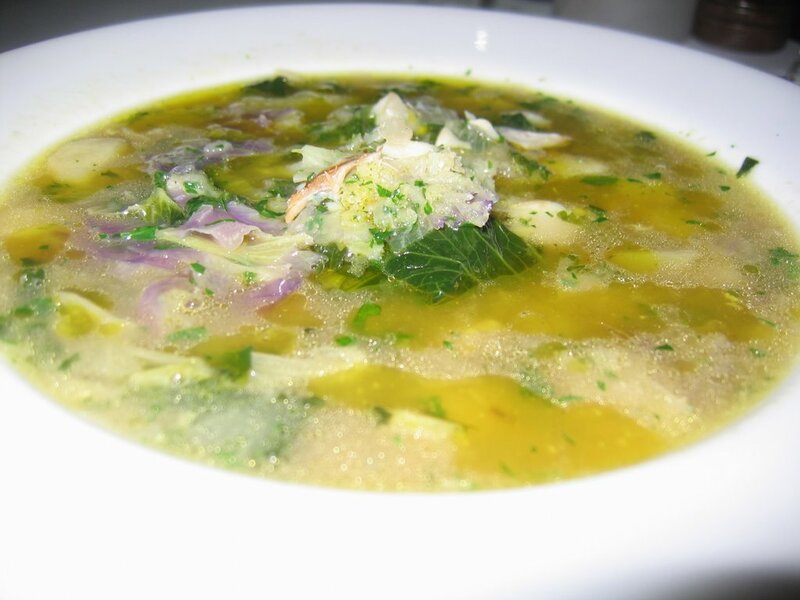 First was the caldo vedure ($15), which on this day was an organic kale and cod soup. The cod flakes added a light saltiness to the very delicately flavoured chicken broth and the kale provided texture and a pleasant ferric bitterness. Potatoes were perfect little cubes that broke apart easily in the mouth and the gorgeous purple hues of kale and dark cavolo nero added colour. 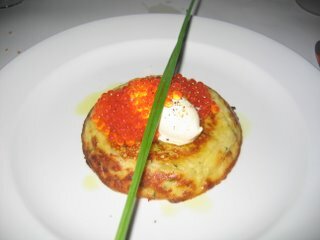 My second dish was the whitebait and potato pancake ($22), which arrived at the table like a plump, golden blini, flecked with chives, and topped with a quenelle of crème fraîche and vibrantly orange Yarra Valley salmon roe. The pancake was firm and gold on the outside with a soft, creamy interior. The crème fraîche added sour lactic oomph and the robust pearls of roe provided bursts of sweet saltiness. Although very decorative, potentially they could have served less caviar. For dessert, Jonas was ridiculously full and decided to have a cognac rather than the cheese platter he had originally planned. 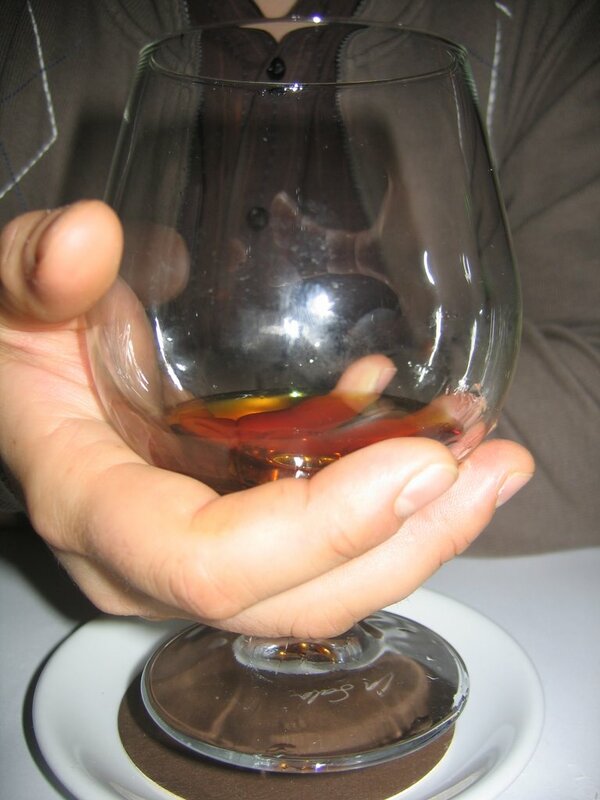 He ordered the Hennessy XO ($24) of which 30ml arrived in a warmed brandy balloon. I pounced upon the mela cotogna ($15), or honey roasted quince. 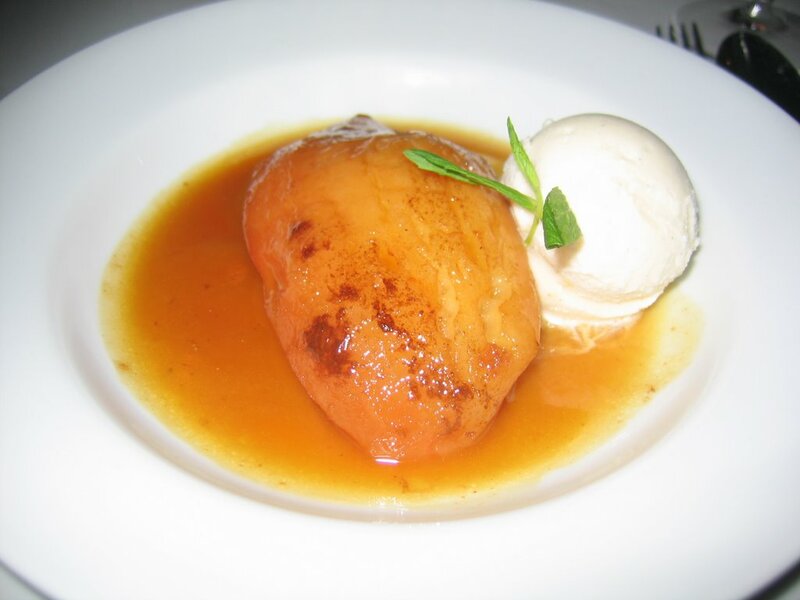 Served with a vanilla ice cream was bright yellow quince flesh, perfectly textured with a soft resistance and smothered in a rich honey glaze. I was really pleased with this choice. Jonas was very impressed by the service (he’s a waiter, so that should mean something) and although I am still in two minds, I have to admit my unease is potentially unfounded. The staff were conscious of customer needs and quite attentive, but unfortunately I felt tables of older patrons received that little bit extra. To be fair to the waiters, experience tells them that this is where their big tips will come from, so I can’t really fault them for leaning towards older customers. On the other hand I had to watch the waiter seemingly fawn over the tables next to and behind us. We were treated very well, but I felt they got it better. Jealousy? I honestly can’t say. Nonetheless, we were seated quickly and introduced to the only special for the evening, then walked through the menu. We were given time to make a decision and then he returned for any last minute questions before taking our order. My queries over wines to match my meal was answered, although not confidently, which concerned me a little. The wait staff visited unobtrusively throughout the evening, checking on water, wine and whether everything was to our satisfaction. Courses were delivered with perfect timing in between and overall the waiters were friendly, knowledgeable and professional. I have only two comments for improvement: first, the tables for two were much too small to fit all our wine glasses, water glasses, olive bowl, oyster plate, breads and olive oils, courses etc etc. 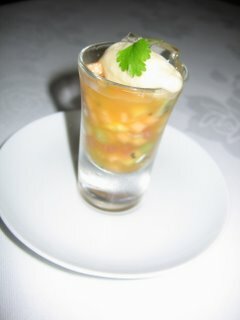 Secondly, the room is so dim that it was only through taking photos that I saw how gorgeously presented my food was. In fact, every dish was exquisitely composed – colours were vibrant and beautiful but no diner ever sees this in such romantic darkness. The total price for two, including a 13% tip, was $255. 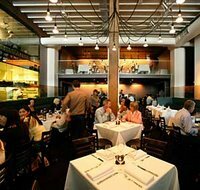 We both were pleasantly surprised that the bill was so reasonable – especially when compared to other restaurants of this calibre. It included cocktails, appetisers, 4 entrées, 1 main and 1 dessert as well as 4 glasses of wine and a cognac. A bargain for such a good meal. This is certainly a place to return to. Prices were very reasonable, produce was excellent and the food coming from the kitchen was superb. The venue itself is very beautiful, creating a wonderful environment to wrap yourself in for an evening. Highly recommended. For my birthday, Slinky Minx, the Platoon Commander of the Wine Angels made me a spectacular cake for morning tea at work. She baked the sponge the night before then assembled the masterpiece at work. Given the sensitivity of this year’s birthday, it was so nice to have someone do this for me. It really meant a lot and I appreciated it. Her bday is coming up soon – I better start thinking of something good!!! Recipe by Kath. Courtney's Nan. 1. Pre-heat oven to 180˚C. 2. Separate eggs. Beat egg whites until stiff. Add sugar and beat until dissolved. 3. Add the egg yolks one at a time and beat very well (approx 10 minutes). 4. Sift cornflour, bicarbonate soda and cream of tartar together 3 – 4 times. Fold flour into egg mixture with a metal spoon. The secret to making is light sponge is the light folding technique. 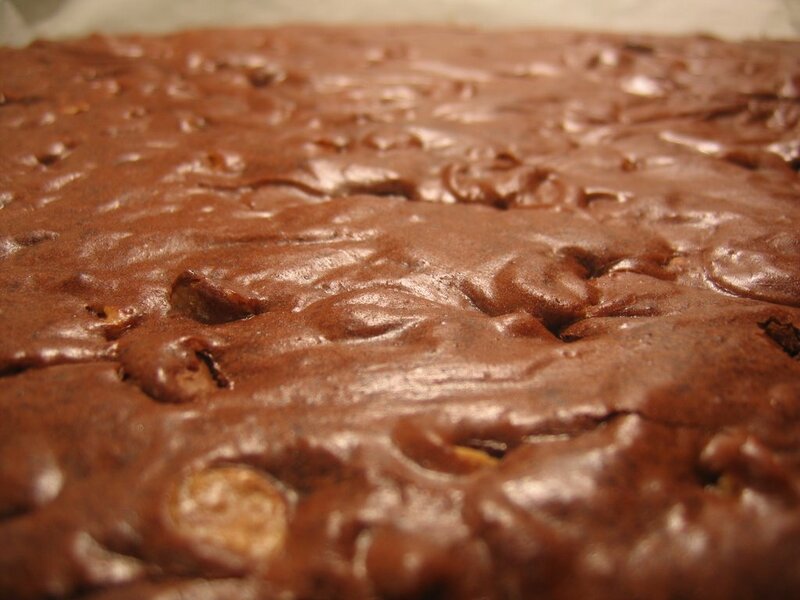 A beating action causes loss of air in the egg mixture and results in a heavy, flat cake. 5. Bake in 2 small, round lined tins in moderate oven for 20 minutes or one 22cm lined cake tin for approximately 30 minutes. 6. When completely cooled, slice each cake in half horizontally and place one cake layer onto a serving plate. 7. Spread with a quarter of the lemon cream, then top with another cake layer. 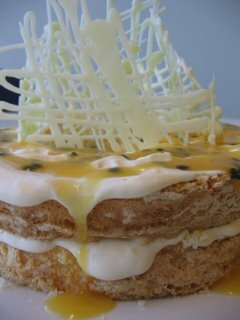 Repeat with the remaining lemon cream and cake, finishing with a layer of lemon cream. Use a fork to roughly spread the cream and create patterns. 8. 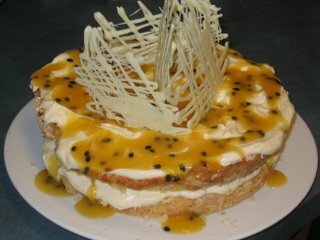 Stir the passionfruit topping slightly to make it a little runny and, if necessary, add a little orange juice to thin it. Pour the topping evenly over the cake, allowing it to run down the side. 9. Stand the chocolate lattices on top. Serve immediately. * Cake is best eaten on the day it is made. However unfilled sponges can be frozen for up to one month. Freeze separately. 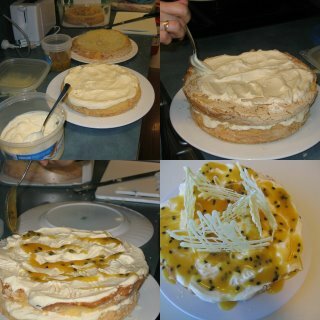 * The lemon cream and passionfruit topping can be stored for up to 3 days. 1. Put the yolks and sugar in a jug and beat well. Strain into a heatproof bowl and add the lemon rind, juice and butter. 3. Whip the cream. Once the lemon curd has cooled completely, fold into the whipped cream. The consistency should be like thick sour cream. 1. Strain the passionfruit to separate the juice and seeds – you will need 125ml passionfruit juice and 1½ tablespoons of seeds. 2. Put the passionfruit juice, seeds, orange juice and sugar in a small saucepan. (In the case of canned passionfruit, add directly to the saucepan). 3. In a separate bowl, mix the cornflour with 3 tablespoons of water until smooth and then add to the saucepan. 4. Stir constantly over medium heat until the mixture boils and thickens, then pour into a small bowl, lay a sheet of plastic wrap directly on the surface and refrigerate until cold. 1. Bring a saucepan containing a little water to a simmer, then remove from the heat. 2. Place the chocolate melts in a heatproof bowl, then place the bowl over the saucepan. Make sure the base of the bowl does not sit in the water. Stir the chocolate over the heat until it has completely melted. 3. Spoon the chocolate into a paper piping bag and pipe lattice patters onto a sheet of baking paper. Leave to set, then peel away the paper. Jonas put the alarm on for 5am then snuck out to get my presents that he had been hiding around the house. When I woke up at 7am, there they were. 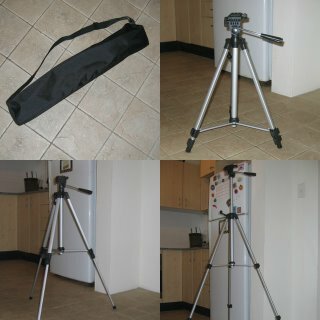 The two presents he gave me were so thoughtful. Now, they may not sound like much to some people, but you have to understand a few things first. Jonas hates this blog. I started it because I was a hospitality widow and was spending a lot of time alone at nights while he worked (in a hotel). I started the blog as a distraction and now it consumes me. I think of it all the time. Everywhere I go I take photos, interview store owners, undertake research and all with the blog in mind. When people ask me "what have you been up to?" all I can think about is the blog. I'm sick! Instead of just spending my alone time on the blog, I’ve started to sit in front of the computer reading up on recipes, ideas, people during “our” time. 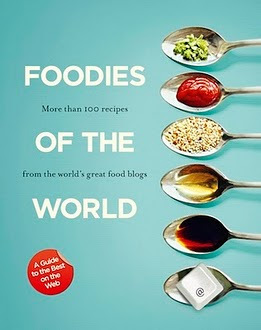 I spend hours sifting through other peoples blogs learning more and more about what’s going on in food circles globally. From hospitality widow to blog widower, it’s a tragic cycle. Another annoying habit I’ve picked up is taking photos of everything I cook, while I’m cooking it and the final product. It’s driving him nuts as he sits at the table, fork in hand and salivating over the meal. I won’t let him touch it until I’m sure I’ve taken a non-blurry photo with the right amount of light. I even do it to the food he cooks! On Monday night, against all odds, Australia beat Japan in our first World Cup game in over 30 years. 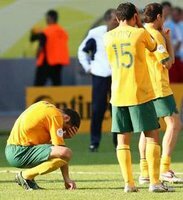 It was a miracle for many reasons, two of which are the horrible facts that Australia has never, ever won a World Cup game nor had we ever even scored one goal at the World Cup! We were down 1-0 the entire game until the last 8 minutes, when Tim Cahill (a substitute) kicked a beauty. Then he did it again! Then John Aloisi (another substitute) kicked the final nail in the coffin for Japan. That's 3-1 to Australia. Yipppeeeeeeee! What a nail-biting victory and since the clock had ticked over to midnight it was technically the 13th and therefore my birthday. The area where I live is traditionally full of Italian migrants who brought football (soccer) to Australia. They are passionate about the game and so the main street was closed to traffic in anticipation for either victory celebrations or angry riots. Throughout the night illegal fireworks buzzed, drums were beaten and people danced in the street. Ahhh, good times. This photo is taken from the Sydney Morning Herald website. Today is my 26th birthday. 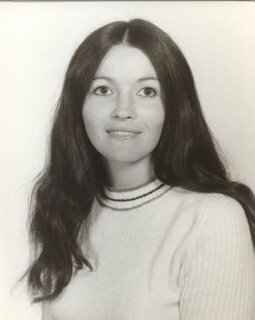 It’s also exactly five years ago that my mother passed away. Yes, I happened to be unlucky enough to lose my mother on my 21st birthday. When she was dying I told her that if she would never meet my children and if she couldn’t be at my wedding then she had to be there at my 21st birthday. She promised she would make it. And she did. It’s somehow poetic that she died on the very day she brought me into this world. Exactly 21 years together, to the day. Other times it’s sad because every year my birthday celebrations are bittersweet. Five years ago and still not a day goes by that I haven’t thought of her. I guess this kind of pain never really subsides. These wonderful little molluscs have been on my mind a fair bit lately. In Australia we use the words clams and vongole interchangeably because it seems that the Italians introduced this delicious bivalve to the Aussie diet. Clams are used all around the world and the two most well known dishes would have to be Italy’s spaghetti alle vongole and the USA’s clam chowder, originating in New England. Clams are shelled marine or freshwater molluscs belonging to the class bivalvia (two valves). This group seems to include oysters, mussels, pipis, cockles and scallops, which either bury themselves into the sand or attach themselves to rocks. In case you live under a rock (no pun intended) and haven’t ever seen a clam before, the soft mollusc lives between two shells which are joined together by a ligament. Background: In Australia, clams have a gutsy flavour and are low priced products. All clams are available year round, except pipis that are scarcer during winter due to the closure of the South Australian fishery. The various species of clams are harvested from the sandy beaches of the Southern Queensland coast down to the Great Australian Bight and Tasmania. In NSW, the fisheries for cockles and pipis are small hand gathering operations. At low tide the fisher’s use their feet to loosen pipis from the sand in the wash, then collect them. Surf clams are hand gathered by abalone divers in Tasmania and vongole are more common in South Australia. Buy: Live products should have closed shells or should close when gently squeezed or tapped. They are also available pickled or frozen. Allow 360g – 600g per person for a main course. Store: Live bivalves do not keep well out of a tank. The severe cold of the refrigerator will cause bivalves to die. The optimum storage temperature for bi-valves is 5-12°C, a cool dark place, such as an esky covered with a wet hessian bag is best. During the warmer months store the bivalves in the refrigerator and use within 2 days of purchasing. 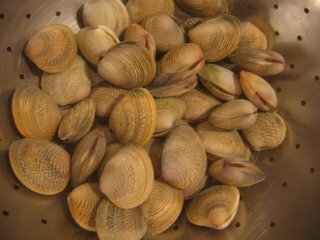 Cook: For clams that have not been purged, place them in a bucket or bowl of lightly salted cool water for 30 – 45 minutes just prior to cooking. To open the clams use an oyster knife to shuck the clams as you would an oyster. Alternatively steam the clams in a large heavy based pot with a tight fitting lid. Pour in enough white wine or water to cover the base, bring to the boil and add the clams, put the lid on tightly and shake the pot occasionally, for 1½ – 3 minutes or until the shells have opened. Keep this steaming liquor to use in the sauce or soup. Discard any shells that do not open on cooking. Well, on Saturday I was home alone and decided to cook this for my own dinner before I braved the rain and wind to go see Tim the Fruitophob play in his band, GangAwry. This is my recipe for spaghetti with a clam and white wine sauce. Serves 4. 1. Start cooking the pasta, following the instructions on the packet until the spaghetti is al dente. 2. Rinse clams, rubbing to remove sand, and discard any open clams that don’t close after being gently squeezed or tapped. 3. In a pot heat the olive oil then fry the garlic, chilli and anchovies. Add clams and parsley, cover and shake pot for 1-2 minutes until clams start to open. 4. Add wine, replace lid and simmer on low until the clams are open. Discard any clams that didn’t open. 5. At this point you can decide whether you want to serve the clams in their shells or whether you want to remove these for ease of eating. If you want to remove the shells, make sure you keep sixteen clams in their shells to decorate each bowl with four shells. 6. Drain pasta and add to pot. Mix thoroughly to coat in sauce. 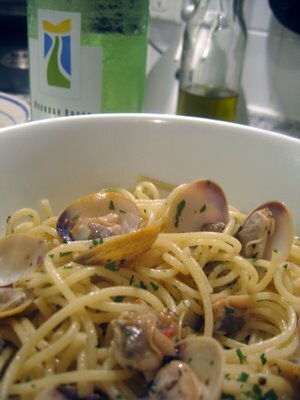 Serve immediately (top with clams in shells if they have been shelled) and drink with a dry white wine.